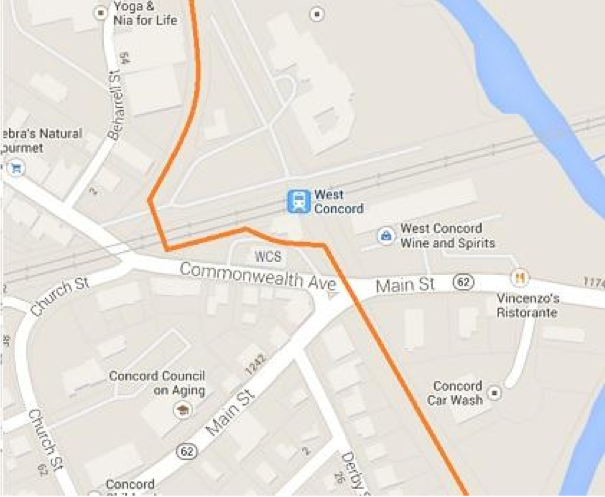 The eagerly anticipated opening of the trail through West Concord, known as Phase 2C, is still scheduled for 2019. This 3-mile section of the trail runs from near Commonwealth Avenue to the culvert under Powder Mill Road. The reconstruction of the intersection of Main Street and Commonwealth Avenue will be completed this fall. New traffic signals also will be installed. The new design will reduce the length of the trail across Main Street, creating a safer crossing for trail users while providing for sufficient turning movement for larger vehicles. The contractor expects to complete paving, fence installation, road crossings, and pedestrian signal installations by mid-November. MassDOT has requested a final inspection at the end of the construction season, with the punch list generated at that time. The Town will then be responsible for maintenance of the trail after the winter season. However, by early fall work on installing the crossing gates and paving th path over the rails where the trail crosses the MBTA Commuter Rail had not been completed. MassDOT and Town of Concord staff continue to remind residents and visitors that the trail is a construction zone in 2018 and that it is unsafe to use. The official groundbreaking ceremony for Phase 2C in Concord was held on July 14 at Brookside Square in West Concord. The overcast skies and threat of rain did not dampen the enthusiasm of rail trail supporters who came to celebrate the start of construction of this phase of the rail trail, which will run from near Commonwealth Avenue to Powder Mill Road. State Senator Mike Barrett acted as Master of Ceremonies and introduced speakers who represented the State, MassDOT, the Town and the Friends. Speeches were followed by the “ground breaking” and serving of cake. Performing the groundbreaking were Select Board Chairwoman Jane Hotchkiss, Paul Stedman of MassDOT, State Senator Mike Barrett, Concord’s Director of Planning and Land Management Marcia Rasmussen, Barbara Pike of the Friends of BFRT, State Representative Cory Atkins and State Senator Jamie Eldridge. Although this phase is not scheduled for completion until spring 2019, signs of progress can be seen from various intersections along the trail. Rails and ties were removed last spring and summer, and erosion barriers were installed. The Powder Mill Road culvert/tunnel was replaced during July and August, with construction completed in time for the start of the new school year. The Assabet River Bridge, a prefabricated steel structure, was installed in September. Also the base coat pavement has been installed on much of the trail, including the new parking lot on Commonwealth Avenue near the Rotary. Construction is continuing on the spur which leads the trail to the crossing of the MBTA tracks. A new set of dedicated railroad crossing gates adjacent to the two high-level passenger platforms at the train station will enable trail users to cross the tracks safely. A schematic diagram for the route of the trail through West Concord village can be seen here: http://bit.ly/2itdJlN Construction updates are available at http://bit.ly/2zyy3FU. Please note: The trail is an active construction zone, and it is unsafe to enter. Come celebrate the many years of engineering, design and waiting in Concord at the groundbreaking ceremony this spring for Phase 2C. Local and state officials will join MassDOT and the Friends to kick off this two-year construction project. Light refreshments (think cake!) will be served. This 2.8-mile section of the trail runs from Commonwealth Avenue to Powder Mill Road. MassDOT awarded the $6.7 million contract for Phase 2C to D.W. White Construction earlier this year. The contractor started at Commonwealth Ave. to clear the right of way and install erosion controls and will move southerly. The contractor also expects to replace the existing culvert at Powder Mill Road this summer during July and August (while school is not in session). The new culvert will be higher and wider, better for trail users. The road will be closed during construction and is expected to be re-opened before the start of school in September. MassDOT District 4 Engineers will be providing construction oversight of this project and will coordinate with the Town as needed. Article 20, which will appropriate Community Preservation Funds to 16 projects, includes a request of$125,000 to be used to complete the 100% design plan of Phase 2C, including acquisition of easements, leasehold, license and/or other real property interests of the land in Concord. Article 57, BFRT Phase 2B, authorizes $250,000 from the Town Manager’s five – year capital plan for completing the design and engineering of Phase 2B, that portion of the trail over Rte.2 that will connect the trail from Acton (Phase 2A) with the trail in Concord (Phase 2C). Article 58, Land Acquisition for BFRT right-of-way, authorizes the Select Board to expend up to $25,000 to acquire permanent and temporary easements for construction and maintenance of the trail in Concord. Article 59, BFRT Easements over Town land, authorizes the Select Board to grant or deed easements over Town – owned land for the long – term use as a rail trail. With the 100% design nearing completion, Phase 2C remains on schedule for construction advertising on August 27, 2016. The public informationmeeting for the 75% design was held by MassDOT last November. An open house prior to the meeting presented the proposed design. The design now includes a new trail alignment across the MBTA Fitchburg Commuter Rail line near the existing mini-high platforms. After crossing the tracks, the trail will run between the new Woods Hill Table restaurant and the West Concord Depot and then continue through Junction Park to Main Street. A new alignment also has been designed for the Commonwealth Avenue and Main Street intersection, creating a “T – shaped” intersection that will enhance safety for trail users as well facilitate traffic flow. The Town is working with the Garden Club to move existing plantings in the traffic island to another location. The culvert under Powder Mill Road is scheduled to be replaced during the current phase of construction. However, MassDOT confirmed that the section of the trail from Powder Mill Road to the Sudbury town line will not be built until the trail is built in Sudbury. This delay is necessary because the trail would otherwise have a temporary terminus in the middle of the woods with no outlet at the southern end. MassDOT is exploring installation of erosion control measures along this portion of the trail. However, construction of other amenities such as planting, fencing and signage for that portion of the trail will be delayed. Secretary Daniel Bennett and Town officials in early February to discuss proposed legislation that will transfer a half-acre of Department of Corrections land to the Town. This land is necessary for construction of a small parking facility (18 spaces) off Commonwealth Avenue opposite MCI-Concord. Two portions of Phase 2 of the rail trail are entirely or mostly in Concord: the crossing of Route 2 from Acton to Concord (Phase 2B) and the main portion of the trail through West Concord to the Concord/Sudbury town line (Phase 2C). The Town’s BFRT Advisory Committee meets monthly, usually on the first Thursday of each month at 7 pm. Observers are welcome and are encouraged to check the Town calendar for any changes in the meeting schedule. Concord’s 75% design for Phase 2C has been submitted to the state for its review. A public hearing on the design is expected to be scheduled for late fall. The current design incorporates a new crossing of the Fitchburg Commuter Rail line near the mini high platform. The trail will then pass between Woods Hill Table and the West Concord Depot, eliminating the need to use the sidewalk in front of the restaurant. Funding for Phase 2C is programmed for 2016, which means that the project will go out to bid by September 30, 2016. Actually construction likely would not start until 2017. Concord’s 2015 Annual Town Meeting authorized $125K in Community Preservation Act (CPA) funds for the BFRT Phase 2C & 2B. This brings the total allocated from CPA funds to $375K for design and construction. The BFRT Advisory Committee and Town staff will be preparing another application this fall to the Community Preservation Committee for an additional $125K to bring the total to $500K. Despite interminable delays, the 75% design of Phase 2C, from Commonwealth Ave. in Concord south to Sudbury, is progressing. Consulting firm Greenman Pedersen Inc. (GPI) expects to submit plans to MassDOT in June. The design has been delayed partly due to the usual governmental red tape.However, the delay is primarily due to the decision to pursue an alternative trail configuration between the new Woods Hill Table and West Concord Depot after the MBTA had accepted an alternative crossing over the Fitchburg Commuter Rail line. While evaluating the new trail alignment through Junction Park, GPI and Town staff also examined existing crosswalks and signals at the intersection of Commonwealth Ave. at Main St. in front of the 99 Restaurant. Given the age of the existing traffic signals and the in sufficient space in the traffic island to create a safe haven for trail users, GPI suggested a new alignment extending Junction Park northerly creating more of a ‘T -shaped’ intersection where Commonwealth meets Main. The intent is to increase safety for trail users as well as to facilitate traffic flow. The preliminary sketch was exhibited at the West Concord Advisory Committee open house, where attendees expressed interest in exploring the idea. Two portions of Phase 2 of the rail trail are entirely or mostly in Concord: the crossing of Route 2 from Acton to Concord (Phase 2B) and the main portion of the trail through West Concord to the Concord/Sudbury town line (Phase 2C). Concord’s 25% design for Phase 2C was approved at Town Meeting in April 2008 and has been approved by the state. By vote of Town Meeting, the surface of the trail will be asphalt and the culvert under Powder Mill Road will be replaced. The Town and the Town’s BFRT Advisory Committee have continued to work with the consultants GPI on furthering the design. The original design has been updated with a new crossing of the Fitchburg commuter line in West Concord. The new crossing will follow the former railroad spur located behind Beharrell Street businesses, cross the MBTA/Town commuter parking lot driveway, then cross the commuter rails just west of the mini-high platforms where new crossing gates will be installed for trail users. The trail will continue through the parking lot between the new Woods Hill Restaurant (former WC Supermarket) and the West Concord Depot/Club Car Café into Junction Park, then cross Main Street/Rt. 62 and continue toward the Assabet River (see diagram). Phase 2B is primarily a 300 foot bridge over Route 2 following the original right of way. After several public meetings and discussions with officials from both Acton and Concord, it was decided to build the bridge to follow the original right of way. The option of building a shorter span perpendicular to Route 2 was rejected because of environmental concerns to the adjacent wetlands.The firm AECOM is currently working on the 25% design of this section. The Town’s BFRT Advisory Committee meets monthly, usually on the first Thursday of each month at 7 pm. Observers are welcome and are encouraged to check the Town calendar for the meeting schedule.